For only the second time in its illustrious history, the New York Staff Band (NYSB) shared the stage with Black Dyke Band, as part of its 129th Annual Festival. Held at a packed Centennial Memorial Temple, many audience members had travelled long distances to be there, some from as far afield as the UK, Democratic Republic of the Congo, Sweden, Canada and various parts of the USA. The concert got off to a high-octane start, with the NYSB zipping through Ray Steadman-Allen’s rarely heard festival march, The High Council. As the band’s Executive Officer, Lt. Col. Kenneth Maynor explained in his introductory comments, those gathered were “looking forward to an energising evening of music played to the glory of God.” After a prayer from Territorial Commander Commissioner Barry Swanson, Black Dyke Band were marched in by the NYSB as it played Under two flags, which appropriately includes Rule Britannia and God save the Queen. Continuing with the theme of marches, Black Dyke performed its signature march, Queensbury. Many of the band had only arrived that morning from the UK, but one would not have guessed as they delivered a programme full of energy. The band’s other first half items included Paul Lovatt-Cooper’s Enter the Galaxies and Fire in the Blood, as well as the most substantial work of the night, Peter Graham’s Metropolis 1927, which featured some of the most dynamic playing of the evening, in the presence of the composer himself. Also showcased were two of Dyke’s outstanding soloists, principal cornet Richard Marshall, who made light work of Terry Camsey’s Life’s Pageant which, of course, would have been well known to the largely Salvationst audience, and Katrina Marzella, who produced baritone playing of the rarest class in Peter Graham’s The Holy Well. Interspersed between these items, the NYSB presented a varied programme of SA and secular music, including the beautiful Prelude on the Hymn Tune Lavenham (Geoffrey Nobes), Dean Goffin’s classic My Strength, My Tower, the entertaining and evocative New York Snapshots – Wonderful Town (Peter Graham), and the virtuosic Brillante, featuring the band’s two talented euphonium players, Ryan McCrudden and Aaron VanderWeele. The second half featured the music of two composers, Peter Graham and Goff Richards as the bands join together as one big massed band. Goff Richards’ ever-popular Breezin’ Down Broadway and his touching arrangement of I’ll Walk with God were sandwiched in between Graham’s barnstorming Phoenix, and the last programmed item of the evening,The Last Amen, to which the audience was invited to sing along! 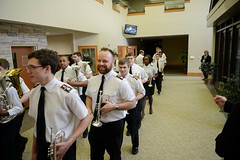 In true Salvation Army fashion, there was nothing better than a rousing march in the form of The Red Shield to bring a spectacular evening of music making to a close. For anyone fortunate to be present, they had witnessed an event that is certain to live long in the memory.